More Hip Hop Electro Fusion. 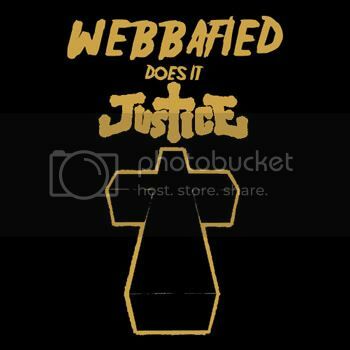 Webbafied, a brooklyn hip hopper, comes through with an entire re-working of Justice's album "Cross". Putting his own touches on every track and following along with the titles and everything you have to give it up for this cat. Its easy to just throw a rap over a Justice track, but this cat is almost putting a finishing touch on them. Check out my two fave's "Genesis" and "DANCE". Webbafied comes correct on both. Love the Phil Collins reference in Genesis! Download the full Cross album off iTunes! Posted on May 1, 2008 by DJ Real Juicy and filed under Dance Tunes and tagged rap Remix.